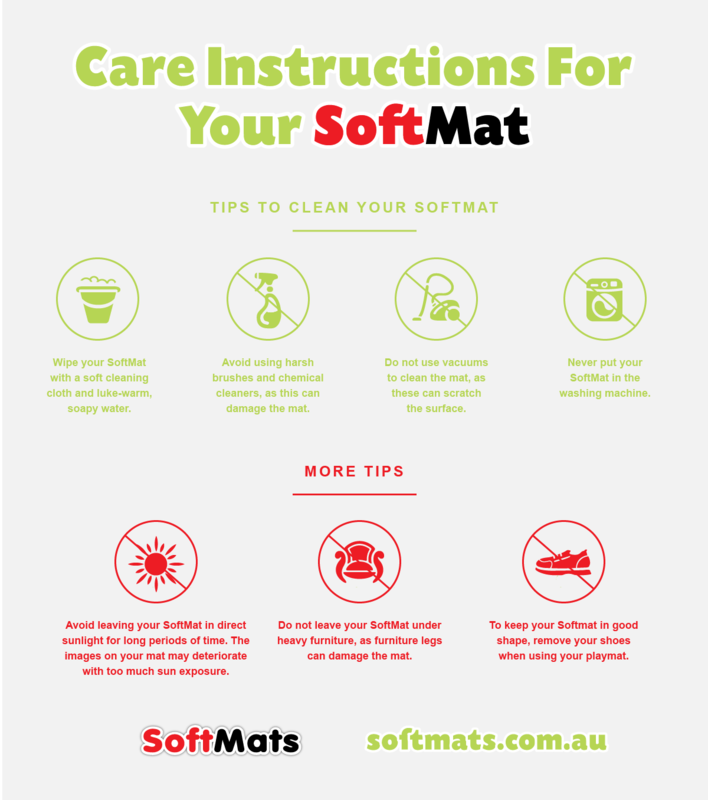 Here at Softmats, we developed our playmats for comfort but also for safety and ease of care. The Bubba Mats™ come rolled in practical cartons with all the product testing, certification, and care information listed. Bubba Mat™ can also be folded easily and packed into a carry bag for convenient regular travel and short term storage. These Black carry bags are available separately for purchase directly through Softmats if required, so please give us a call to discuss. For long term storage rolling is advised and ensures the mat will always look its best, so please keep your box accordingly. Included on your Bubba Mat™ carton are guidelines outlining maintenance and use of your mat, and these important guidelines are listed below. For first use and cleaning please wipe with a soft cleaning cloth and luke-warm soapy water. Please avoid harsh brushes and chemical cleaners as the use of these may damage the mat. Do not use rotating-head vacuum's on the surface as these will damage the mat. Avoid regular vacuum's as these may also scratch the surface. These products cannot be washed in a washing machine, nor can they be dry or steam cleaned. There will be some minor creasing from the rolling after unpacking, however with the elastic characteristics of the mat these will settle over time with regular use. The Dwinguler and Bubba Mat designs do repeat for the manufacture process, and each mat is sealed and trimmed individually. As such the design on each mat will vary in positioning when compared to another. The softness of the mat will vary depending on the temperature of its environment. The warmer the environment the softer the playmat will tend to be. Avoid leaving these products in direct sunlight for long periods of time as the images are likely to deteriorate. As the mat protects the surface beneath, there will be varied wear on your flooring. It is recommended that you regularly move your mat. Do not leave this product under heavy furniture as the depressed area may be damaged and not return to its original state. Please remove shoes when using your Bubba Mat, and avoid sharp, rough, and hot materials from coming in contact with this mat as they can cause damage. Not suitable for animals or pets as they may damage the mat. Do not use this mat for any other purpose than as a family floor mat, and ensure infants are always supervised whilst using this product. Be sure your baby or child does not draw on the mat with pens and markers as this may be difficult to remove. If you have any questions about our playmats, you can check out our FAQ page or give us a call.